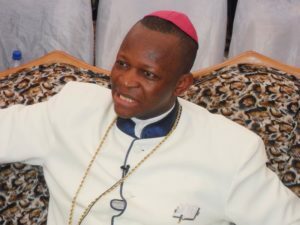 Co-coordinator of the Interfaith Anti-Corruption Network in Nigeria, Bishop Emma Isong has advised President Muhammadu Buhari to reorganize the judiciary and the National Assembly. Stating this at the Lagos Chamber of Commerce and Industry Conference and Exhibition Centre, Alausa, Lagos, the cleric added that his advice is to enable the government to be more active in punishing corrupt public officials. He further added that the greatest enemy of corruption is unity, that if citizens unite, corruption would be defeated. The Bishop urged everyone, irrespective of religious background to work together to fight this cankerworm that has eaten deep into the nation’s fabrics. Suggesting that the punishment to be meted out to those found guilty of corrupt practices should be made to return the proceeds and should serve jail terms to serve as deterrent to others. This entry was posted in Belief, Christianity, Faith, News and tagged Anti-corruption, Bishop Isong, Inter-faith. Bookmark the permalink.